Home to dozens of marine species, including the four turtles known to nest in the Osa, two species of dolphins, and even Whale Sharks, Gulfo Dulce is an incredible addition to the biodiverse rainforest that surrounds it (Bessesen, 2011). An inlet, protected from the rough waters of the Pacific, and with waters as deep as 300 meters, it is the perfect birthing spot for many animals, especially the majestic Humpback Whale (Golfo Dulce). This calm water paradise is also a beautiful and popular boating spot for locals and tourists, and Crocodile Bay Resort plans on creating a new marina and luxury hotel resort to attract more people to this stunning region. Unfortunately, conservationists and local biologists predict that the size of the marina will create more disturbance than benefit, and will cause harm to the marine life of the bay. Increased fishing and boating will increase noise pollution, drowning out communication between marine wildlife trying to find mates or calves calling out to their mothers (Noise Pollution in the Sea). Crocodile Bay Resort claims that their project would create 400 new direct jobs and 400-800 more indirect jobs. Locals counter that those jobs will largely be for English speaking non-Osa native people. Then there’s the issue of transportation, which will require parking lots be built; and sediment runoff from vehicles can occur as well. This runoff can be a toxic addition to the bay, harming marine wildlife around the new hotel and marina (Bessesen). Despite the allusion of some benefits, there appear to be more arguments against a much larger marina. A recent article in The Tico Times describes a court ruling in favor of conservation by disallowing building on the new hotel for the time being. The ruling, after an appeal was made by local conservation groups, states that until the court can be absolutely certain that the building will not cause any harm to the environment, no initial construction can take place. The previous data that had been used in the court had been supplied by independent Crocodile Bay researchers and, as our own Manuel Ramirez explains, “…their environmental studies consider the impact of each part individually, but they do not consider the environmental impact as a whole (Arias).” These studies skew the results in favor of promoting the marina. Each part of these studies makes it seem like the effects are very small, but multiply that by the number of projects that this build will include and it will have the propensity to have a significant effect..
An important example of this possible detriment is increased sightings of bottlenosed dolphins with skin lesions. As Brooke Bessesen, recipient of Osa Conservation’s Greg Gund Scholarship the last two years , goes further into in her summary and report , these lesions are very likely Lobo-mycosis, a chronic dermal fungus that is likely the result of chemical and organic pollutants caused by human activity and runoff (Bessesen). This entire issue has also spurred the organization of the community into The Community Front of Gulfo Dulce . This effort by the local community attempts to promote awareness of what the concerns for this build are and how it will affect the environment in a negative way. The effort was created to get a manifesto signed and brought to the government in order to stay their hand and have more research be done before this detrimental project was undertaken. With the passing of this new verdict and through the efforts of the Community Front of Gulfo Dulce there is a new hope in preventing the expansion of the detrimental hotel resort and large marina. In the long run, hopefully this will maintain healthy and constant population levels, and keep the bay the amazingly diverse and spectacular place it is today. 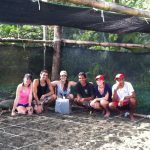 With so many volunteers on the calendar, dozens of sea turtles arriving on our beaches, and the hard work of the field assistants and interns, Osa Conservation is opening its doors and is beginning the 2013 volunteer season. The first volunteers arrived last Friday and during a patrol had the good fortune of finding one of the most precious visitors of the Osa Peninsula. On Sunday night a hawksbill turtle(Eretmochelys imbricate) visited Piro beach to carry out its ritual reproductive magic. Almost three years have passed since the last sighting of a hawksbill on this beach. This caused the joy of field assistants and volunteers who knew the grave danger this species was putting itself up against. The hawksbill turtle is one of the seven species of sea turtle that inhabits the waters of all oceans in the world. It is characterized by overlapping shields on its shell (instead of contiguous shields found in other species) and for having the most colorful and beautiful shell of all the species of sea turtle. Unfortunately, its beauty is also its misfortune because its shell has historically been used for jewelry making, remedies, and decoration. The indiscriminate capture of hawksbill sea turtles has caused their global population to decline by more than 80%(Meyland and Donnelly, 1999). Currently the hawksbill turtle is considered a Critically Endangered species by the International Union for Conservation of Nature(IUCN). The finding of this turtle coincided perfectly with the opening of the opening of the sea turtle nursery on Piro Beach. Therefore, the clutch(eggs) of this hawksbill turtle was the first of the 2013 season to be relocated to the Osa Conservation nursery. This nursery is a conservation tool and an opportunity to educate the community about the importance of protecting these beautiful animals and their habitats. We hope that more volunteers visit us for the rest of the season to be a part of the conservation efforts of marine turtles at the mystical Osa Peninsula. For more information about this project or other volunteer projects, write us an email to volunteer@osaconservation.org. Neotropical migratory birds inspired an international agreement between Costa Rica and the United States last month. These birds migrate back and forth between the United States and Canada and Central and South America. They carry out important reproductive functions in the north and migrate south during the northern winter months, where food is more plentiful. The dual importance of both regions in the lives of these birds brought about a “sister parks” partnership, signed between Costa Rica’s National System of Conservation Areas (SINAC), the St. Croix National Scenic Riverway and 12 other U.S. National Park System units in the upper Midwest. SINAC is Costa Rica’s national parks administrator and oversees 150 protected areas, including 26 national parks. This was a three and a half year process and was made possible by a grant from Rotary International’s District 5960. The idea of a “sister park” utilizes public outreach to shine light on the migration of neotropical migratory birds in hopes of protecting their habitat. Both sister parks mutually benefit each other through education, volunteering, and conservation efforts in this partnership. Christopher Stein, who signed on behalf of the 14 National Parks units and is the superintendent for Saint Croix National Scenic Riverway in Wisconsin said, “National Parks, both in the USA and in Costa Rica, are well known entities. By taking advantage of this public relations fact, we hope to raise the visibility of the plight of our shared Neotropical Migratory Bird species.” They are now determining what the possibilities of the partnership will include, one being the sharing of park staff. In August, Guido Saborio from Area de Conservacion Osa (SINAC-ACOSA) will travel to Minnesota and Wisconsin and learn about three of the new “sister parks” in the region. “This year, we hope to develop an ‘Action Plan’ that will provide us further guidance on collaboration” says Stein. Manuel Ramirez, the executive director of Osa Conservation, said that Osa Conservation played a role in streamlining the efforts of the agreement to make it come about more quickly and will also make its facilities available for the training of both Costa Rican and US national park staff. Ramirez stated that habitat destruction is their biggest threat for the neotropical migratory birds. This is why Osa Conservation actively protects over 4,000 hectares of land outside Costa Rica’s Corcovado and Piedras Blancas National Park, both of which are under this “sister parks” agreement. These private conservation lands help create important biological corridors with the parks and many species depend on their forest connectivity and protection. This “sister parks” agreement not only will address habitat protection in the tropics, but will also raise awareness for two biologically diverse regions and encourage international conservation cooperation. 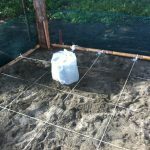 We have all heard about the different ways of attracting birds to our backyard. For example, people hang ripe bananas, provide plants with colorful flowers that are visited by hummingbirds, or place feeders with seeds. However, few people know how to attract bats into their backyards, and fewer yet would wish to given their bad reputation as blood-sucking elusive creatures. Osa Conservation, together with Fundación Universidad de Golfito, is using bat boxes to lure fruit-eating bats into areas that are in need of rapid forest regeneration. Fruit-eating bats are one of the most important seed dispersers in the tropics. Their fruit consumption increases dispersal distance from parent plants, seed germination, and seed survival. They disperse keystone species, and help maintain forest diversity because of their diverse diet. In addition, bats aid in forest regeneration because many of their food plants are pioneer species, and bats deposit their seeds in highly disturbed areas where other frugivores rarely venture. Therefore, a healthy frugivore bat community is important for successful forest regeneration and the maintenance of diverse plant communities. However, bats loose essential roost trees by deforestation. Also, bats are often regarded as pests and their roosts are destroyed, which affects bat distribution with concomitant effects on seed dispersal. Artificial bat roosts have been suggested as an effective tool for facilitating bat colonization of deforested areas, thus supporting seed dispersal and potentially accelerating reforestation. To attract fruit-eating bats, we built 32 bat boxes that were placed in three different sectors of Osa Conservation’s properties. After almost 10 months, more than half of the boxes have been colonized by bats. We are mainly interested in attracting fruit-eating bats that could provide an important source of seed input, but other species have arrived as well. 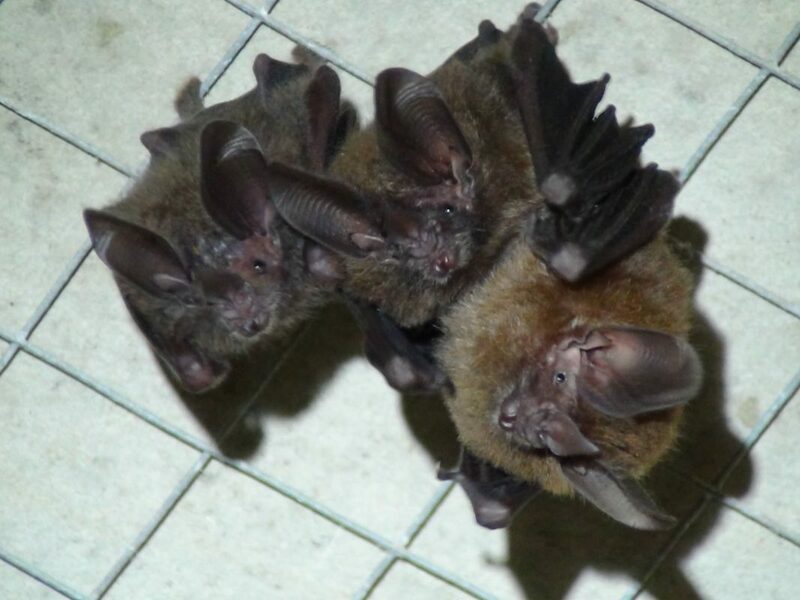 These include the common (Micronycteris microtis) and the hairy big-eared bats (Micronycteris hirsuta), which eat insects and are important for keeping insect pests at bay; a nectar and fruit-eating bat of the genus Glossophaga; and a short-tailed fruit bat of the genus Carollia. At the moment, the most abundant bats at the boxes are insectivorous, but we have observed a steady increase in the abundance of fruit-eating bats, and accumulation of seeds at the base of the boxes. Overall, our project has been very successful. We have had excellent colonization rates of bat boxes, which in most other regions of the world tend to be much lower. 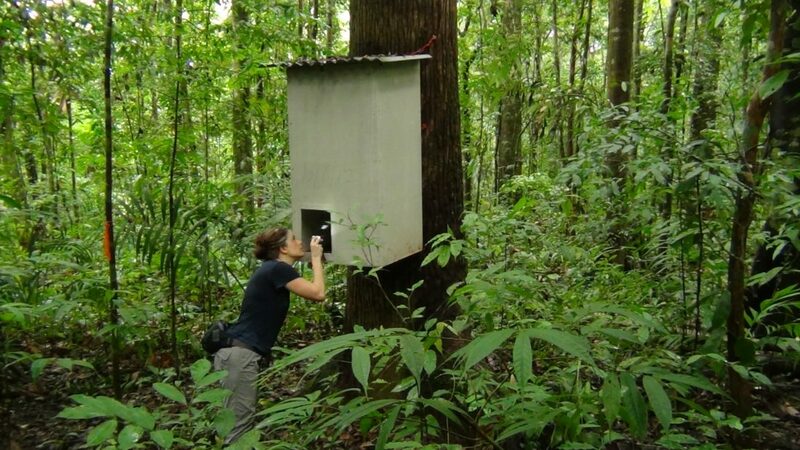 Some of the boxes have been permanently colonized by large groups of bats, and although these are mainly insect-eating, they still serve an important ecological role in tropical forests. We will continue to monitor the boxes for at least one more year, and hope that at the end we can convince other organizations and landowners to consider using artificial bat boxes to aid their forest regeneration efforts.